Landing page experience – Google’s calculation as to how likely your landing page is to be relevant and provide a good user experience. 1. 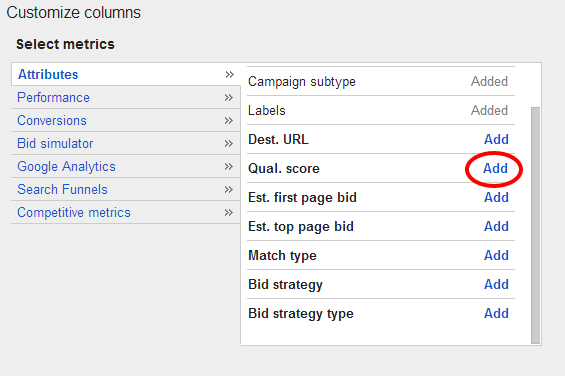 Log in to your Adwords account (adwords.google.com) and click on the Keywords tab. 2. Click on the Columns button at the top and click Customize Columns. 3. Under Attributes, you will see Quality Score listed. Click Add. 4. You can now drag the column up in the list so that it shows up easily when you go to that tab. Just click on the 6 dots and drag. 5. Click the blue Apply button. Now you will see the Quality Score on the Keywords page. You can even click on the column heading to sort by Quality Score and find your problem areas. I work to get a Quality Score of at least 6/10 for keywords which are really important. A higher Quality Score is always better. 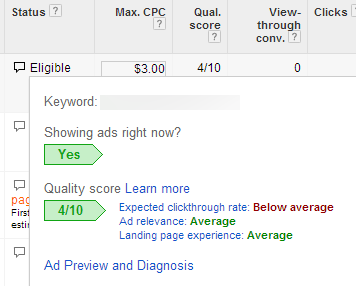 Since there are 3 things which may affect your Quality Score in Adwords, how do you know which of them is causing you to have a low score? The best way is to mouse over the text bubble looking icon under Status. This will show you all three of the criteria on which Quality Score is based and let you know what is causing you problems. How to fix your quality score depends on what is causing the low score, so I’ll walk you through each one. Making the headline of the ad match the keywords more closely. If your headline exactly matches the keyword, it will often perform well. Using more than one word keywords (one word keywords tend to be too general to perform well). Google recommends the following to improve landing page experience. They have lots of other free tutorials, as well. If you are looking for help in getting your Adwords campaign working more effectively, Webster Digital Marketing can help. Contact us today or leave a comment below with your question.